What is software process and software process framework ? Explain. Process defines a framework for a set of Key Process Areas (KPAs) that must be established for effective delivery of software engineering technology. This establishes the context in which technical methods are applied, work products such as models, documents, data, reports, forms, etc. are produced, milestones are established, quality is ensured, and change is properly managed. A process framework establishes the foundation for a complete software process by identifying a small number of framework activities that are applicable to all software projects, regardless of size or complexity. 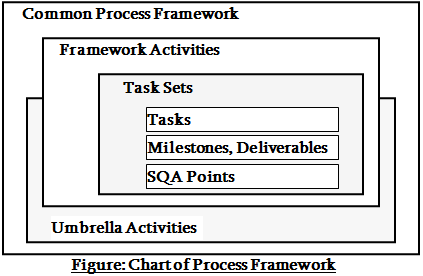 It also includes a set of umbrella activities that are applicable across the entire software process. Some most applicable framework activities are described below. This activity involves heavy communication with customers and other stakeholders in order to gather requirements and other related activities. Read More: What is Software Specification Activity? Describe the four main phases of software specification activity? Here a plan to be followed will be created which will describe the technical tasks to be conducted, risks, required resources, work schedule etc. A model will be created to better understand the requirements and design to achieve these requirements. Here the code will be generated and tested. Here, a complete or partially complete version of the software is represented to the customers to evaluate and they give feedbacks based on the evaluation. These above described five activities can be used in any kind of software development. The details of the software development process may become a little different, but the framework activities remain the same. What is CMMI ? Describe the levels of CMMI.